CD Tin Mini Book Tutorial - Oh, the possibilities! 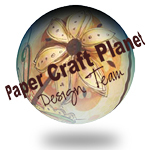 When Maria, from Kitchen Sink Stamps, asked me to do the Project of the Month for the month of April, I was flattered and thrilled at the same time! As Maria and I talked over email, we discussed doing a cute little mini book of some sort. She knows I have a love of handmade books, photos and scrapbooking, so this was a great project for me to work on. Maria got a hold of some CD tins and we decided on a CD tin mini book! This was actually my first time working with a CD tin, but I've fallen in love! The possibilities are endless with these amazing tins! They're a great price at only $3.50 for a pack of 2 tins! So..........I've created a tutorial to show you how easy these little mini books are to put together. And I'll also show you how to use up all those gazillions of free CDs that get sent to you in the mail. If you're anything like me, you probably have a whole drawer of these CDs, just waiting to be used, but not knowing WHAT to use them for. I can't bear to throw them away because, well, you know....I just might need them for a craft project. And guess what??? I DID! And once you make one of these mini books, you'll be asking all your friends for THEIR stash of CDs. Trust me, they're addictive! 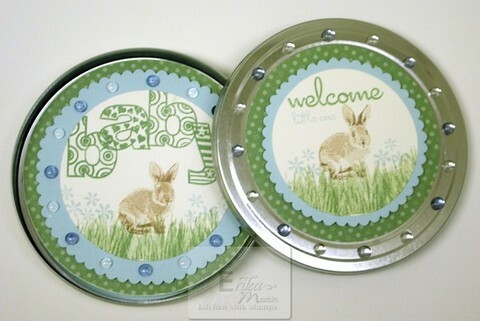 And with these CD tins, you have the perfect size gift container for your mini books! 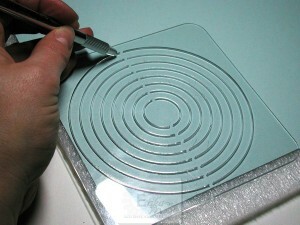 Step 1: Apply adhesive around the outside edges and center of 2 CDs. Step 2: Place the CDs on a piece of patterned paper (if you're using double sided patterned paper, place it on the side you DON'T want to use). 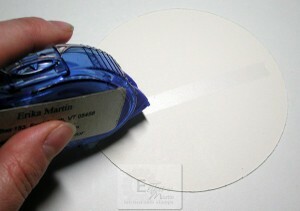 Step 3: Use a hobby blade (X-acto knife) or scissors to trim around the CDs. Repeat steps 1-3 for the other side of the CDs so that both sides are covered with patterned paper. 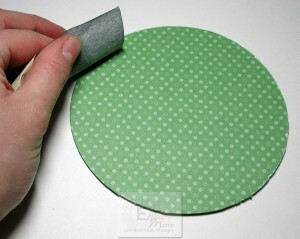 Step 4: Use a piece of fine grade sandpaper to sand around the edges of the patterned paper. This will give it the paper a nice smooth edge. Step 6: Mount a Soft Sky circle on each CD, only one ONE side each of the CDs. Set the other 4 circles aside to use later. 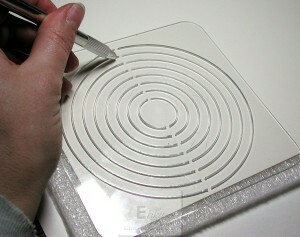 Step 8: Apply adhesive in a line across the center of all 6 Very Vanilla circles. Step 9: Adhere a length of grosgrain ribbon (I used Very Vanilla) across the Very Vanilla circles, leaving a half inch in between each circle. You'll have a "chain" of 6 circles attached to the ribbon. Trim the ends of the ribbon on the first and last circle so that it's about a half inch short from the edge of the circles. 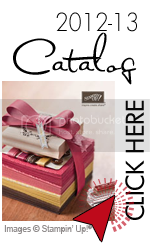 This way, you won't see the ribbon ends when you put the book together. 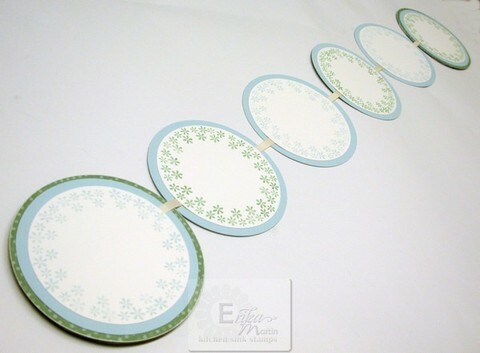 Step 10: Apply adhesive to the outside edges of the Very Vanilla circles and across the ribbon on top of the circles. 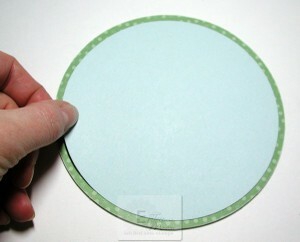 Do NOT apply adhesive to the half inch sections of the ribbon in between the circles. 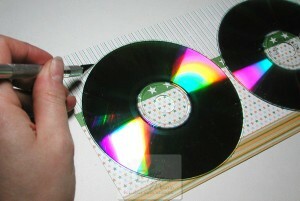 Step 11: Mount the first and last circles of the "chain" to the covered CDs. These will become your book covers. Mount the 4 circles on the "inside" of the "chain" to the remaining Soft Sky circles. The inside of your book is now finished and you can decorate it any way you like. I used the tiny flower cluster from the Playful Ovals set in Soft Sky and Wild Wasabi ink to decorate a frame around each of my pages. These pages can be used for photos and journaling. If you wanted to, you could even decorate the backs of the pages to get even more use out of your book. The pages fold up accordion style to close the book. You can have about 12 pages in your book before it gets to be too snug in your tin. Of course, it also depends on what you use to embellish your pages and the cover of your book, as well. If you wanted to, you could also make your pages out of covered CDs for more stability. If you did this, though, you wouldn't be able to fit as many pages in your book, as the CDs are a lot thicker than cardstock and will make a bulkier book. 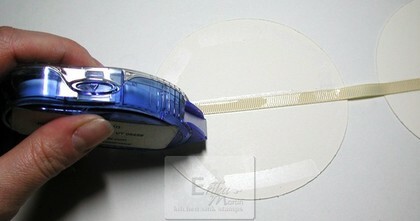 You'd follow the same process as you did above, but would just add your inner pages onto a covered CD. Don't forget to decorate the front of your book and your CD tin, too! You can click on any of the pictures in this post to pop up a larger view. For the cover of my book, I used the little flowers that I used on the inside pages of my book. I also used the new Honey Bunny set (which seemed so soft and baby-like for a baby album). 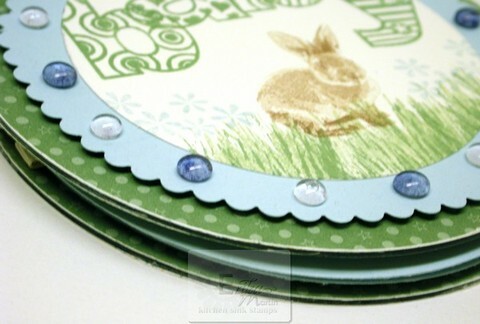 I stamped the word, "baby," above the bunny using the Playful Alphabet set with Wild Wasabi ink (by the way, the patterned paper is in Wild Wasabi and is from the now retired Special Delivery Boy Simply Scrappin' Kit from Stampin' UP). I overlapped and staggered the letters to make them all fit, but they look cute this way. I used a pair of scalloped edged scissors to trim around the Soft Sky circle. I've discovered anew those decorative edge scissors that were all the rage about 7 years ago and have been sitting in my tool turn-about for that same amount of time. They've been sadly neglected for a while but it seems that they're becoming popular once again. 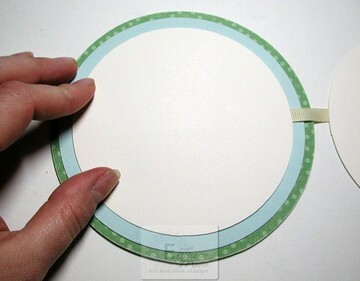 Now that there are all those cool die cut machines out there making those scalloped edged circles and ovals and such, I realized that I don't really need them because I kept my scalloped edged scissors! 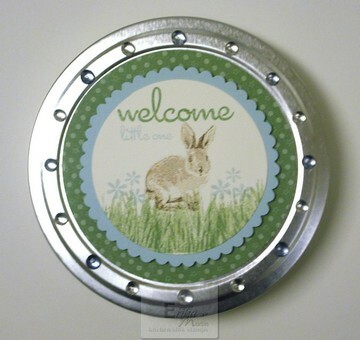 I used the same scissors to trim around the Soft Sky circle on the top of my tin, as well. 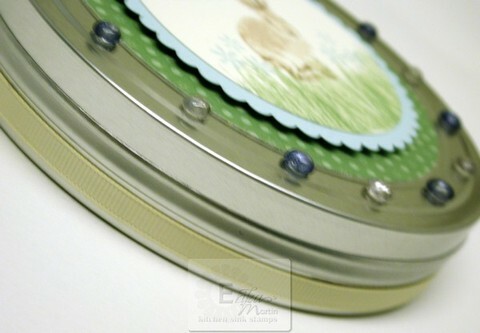 I mounted both of my scalloped edge circles on my book cover and tin cover with some pop-dots for extra dimension. To put the little Dew Drops on my projects, I like to use Mini Glue Dots. They're the ideal size for these drops and you don't have to get your hands messy and they stick firm and instantly. To decorate the edge of my tin, I used some Sticky Strip on a length of 1/4 inch wide Very Vanilla grosgrain ribbon and wrapped it around the tin edge. I trimmed the ends so that they meet up with a nice clean seam. The first time I put the ribbon around the tin, I used a regular double-sided adhesive and only used it in spots along the ribbon. When I opened the tin, though, I found that the ribbon slid around too much under the pressure of my fingers and the handling of the tin. I took the ribbon off, put the Sticky Strip across the whole length and there's no more sliding around. It sticks good and firm. It may use up a long strip, but it's well worth it and that ribbon around the edge really adds such a nice touch. I used the Never a Loss 4 Words set for the "welcome little one" words on the top of the tin. I stamped those with Wild Wasabi and Soft Sky ink. 've created 2 more tins with mini books using different themes. I'll be showing those throughout next week, so make sure you check back to see what else you can do with these! I hope you've enjoyed this tutorial! I'd love to see what you create with it, so make sure to send me a picture of your creations!